Suitable for injection molding machine under 450T clamp force. 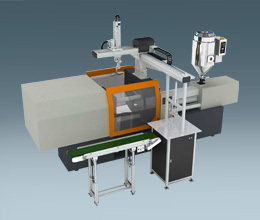 The system designed for single face mold with 1 or 2 cavity. Place labels and take out products automatically and rapidly, cycle time is 7 to 9 seconds, improve the production efficiency and the product quality. Strong and stable frame design.